Bud is a huge Thomas the Tank Engine fan and we've been lucky enough to receive a few Thomas & Friends items for review this year. The latest one may well be my favourite. We have received Thomas & Friends Amazing ABC, a gorgeous hardback book from Egmont Publishing. 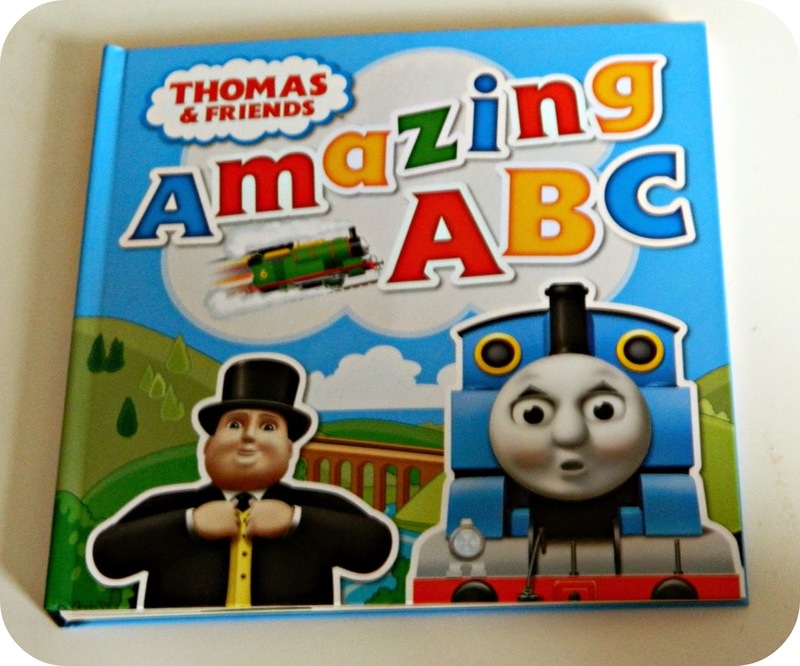 Thomas & Friends Amazing ABC is a large, square, hardback book with 24 pages. Each page features one or two letters of the alphabet with a reference from the Island of Sodor to match each letter. Many of the pages feature an activity, from a removable telephone handset on 'C for Call', to a Thomas who can be pulled down a ramp on 'O for Owen' as well as various flaps to open and lift too. 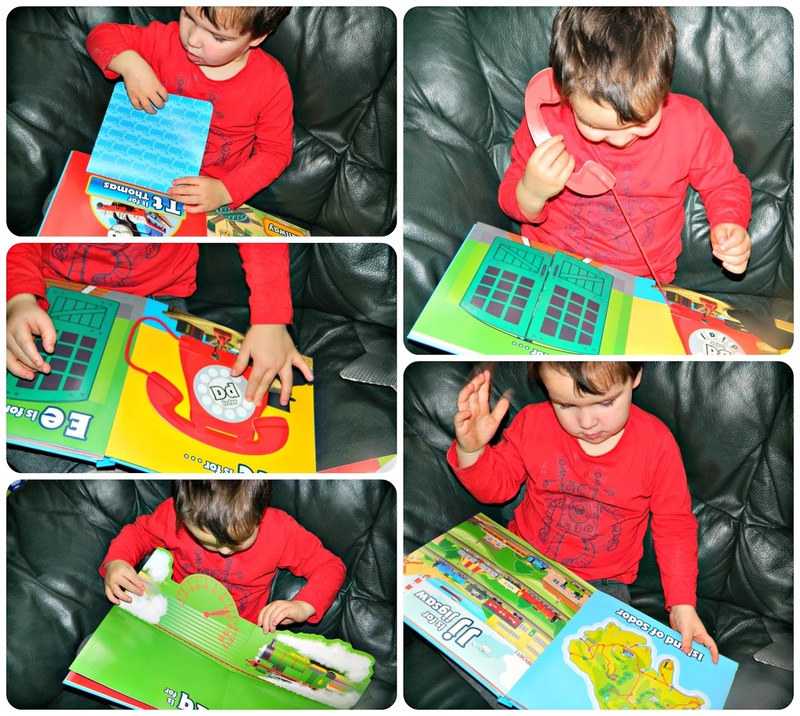 It's a beautiful, brightly coloured book and really engaging as your child turns each page to see which letter is next, and how they can interact with each one. I really like that each letter is shown in both upper and lower case and I think that this book allows your child to learn without realising they are doing so. On 'N is for Number' seven of the engines are shown with just their number underneath, this is a great page for helping young children to learn to recognise their numbers as, if like Bud your child knows that Thomas is number one, Gordon is number four etc they will then realise that is what the number is below their picture. Bud has been completely entranced by this book and he hasn't put it down since it arrived. Both Ian and I have spent time reading through it with him and he has spent a lot of time looking at it himself. He already knows what most of the pages say and I feel that it is a useful tool to help with those first building blocks of reading and starting to understand what letters look like. The pages are interesting and involving to him and his familiarity with Thomas & Friends can only add to the enjoyment. This book has an RRP of £12:99 which makes it a little more expensive than many children's books but I think it is well worth the cost. It really is a lovely book and manages to effectively combine education and popular characters in a really effective way, far better than many books I have seen which have tried to do the same. I'd highly recommend this for any young Thomas & Friends fan. It's available from all the usual stockists and is just £9:09 currently at Amazon. Disclaimer: We received this book for the purpose of this review. All opinions are honest and unbiased.